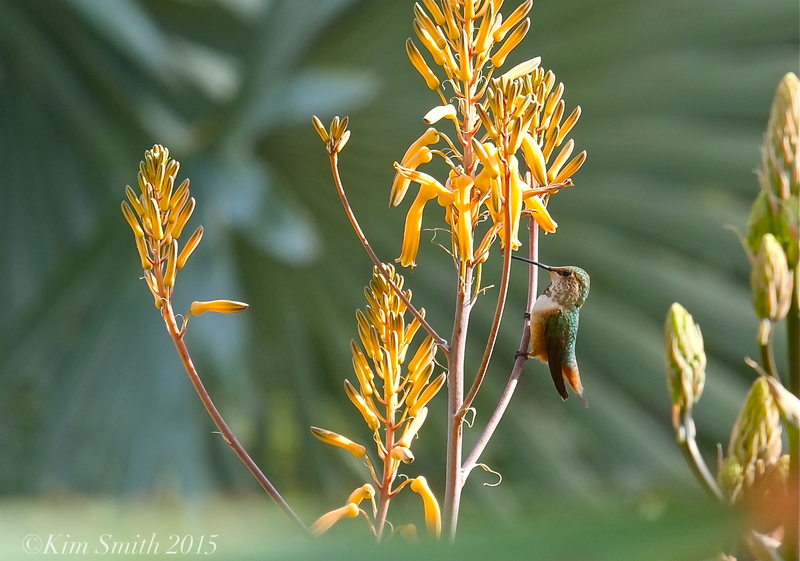 While visiting Liv and Matt in southern California we saw what seemed like zillions of hummingbirds. It’s early spring there with many flowering trees coming into bloom and the hummingbirds are on the move. 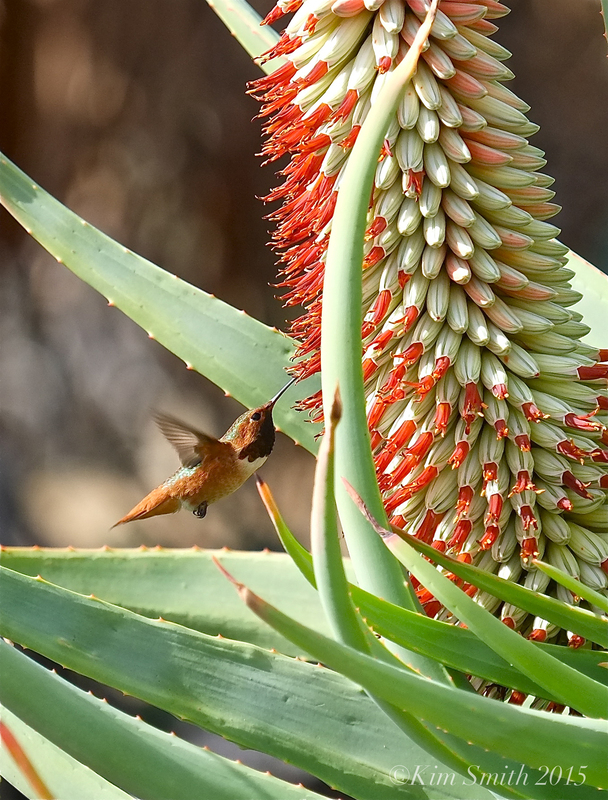 They are drawn to the flower’s nectar and they also eat the small insects that are attracted to the blossoms. 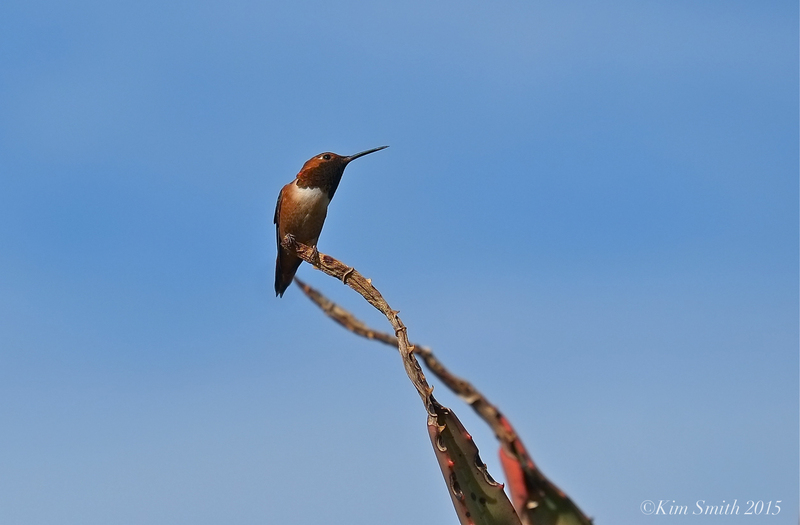 Unlike the Northeast, where typically only one species of hummingbird breeds in our region (the Ruby-throated Hummingbird), fourteen different species of hummingbirds have been reported in southern California. The five that are most common, of which we saw three, are Allen’s, Anna’s, Black-chinned, Rufous, and Costa’s Hummingbirds. Looking at the gorget is one way to tell the different species apart however, that can be a bit misleading because unless the light is hitting the brilliant iridescent feathers at just the right angle, the feathers will look dull and dark. The gorget (pronounced ˈgȯr-jət) is the patch of feathers found on the throat or chin of an adult (not juvenile) male hummingbird. The word gorget comes from the swath of metal worn by knights-in-armor to protect their throat. The Eastern Ruby-throated Hummingbird takes its name from its gorget. Hummingbirds have possibly the most iridescent feathers known in birds. The beautiful iridescence is found not only on the gorget but the wings, head, neck, and back. 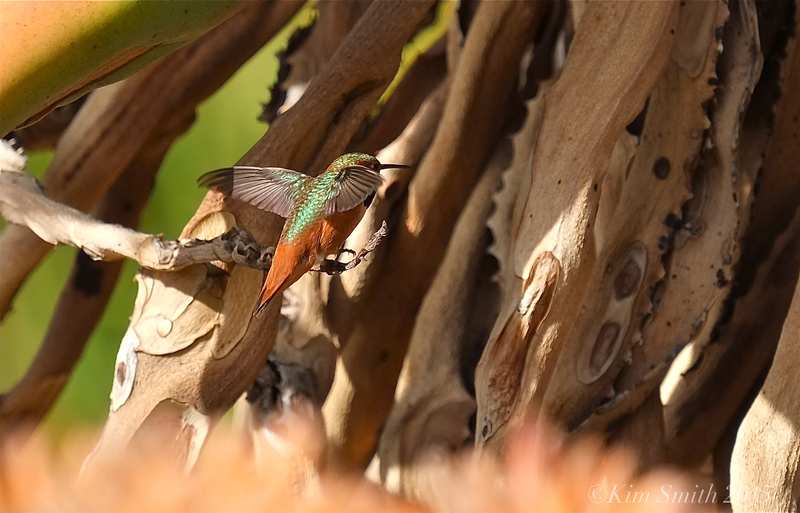 Reasons many are speculated as to why hummingbirds have iridescent feathers; perhaps to confuse predators, to attract a female, or to guard its territory. 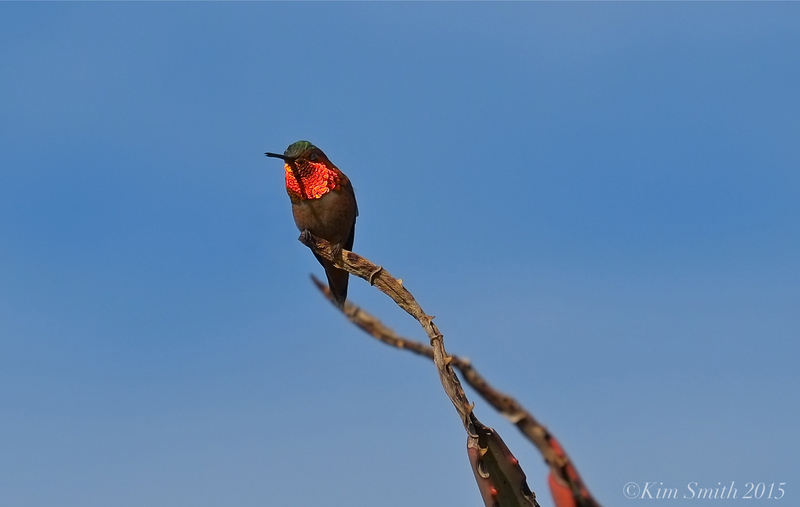 As the male Allen’s Hummingbird turns its head from side to side, the light catches the barbed cells of the glittering gorget. The photo above and the photo below perfectly illustrate how, with the tilt of its head, you first see the iridescence in the gorget, and then not at all. Fun hummingbird fact: A group of hummingbirds may be called a bouquet, glittering, a hover, shimmer, or a tune of hummingbirds. 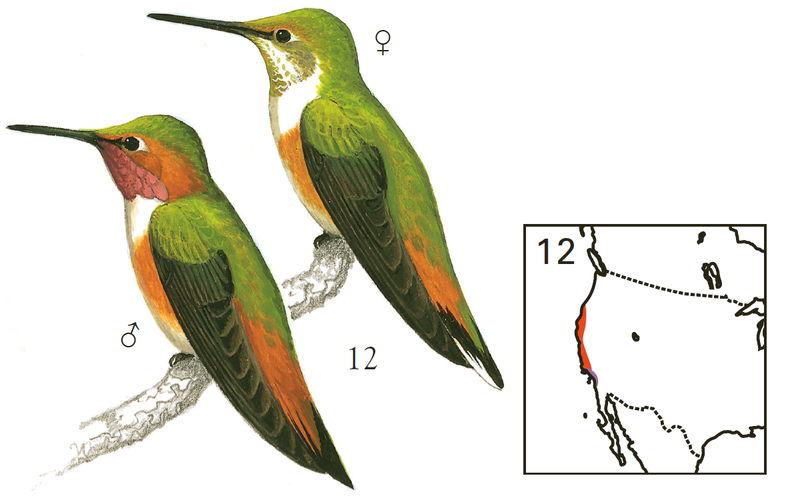 This entry was posted in Hummingbirds, Liv Hauck, Native Plants, Southern California, Wildflowers and tagged 5 most common species of hummingbirds California, Allen’s Humminbird, and Costa’s Hummingbirds, Anna’s Hummingbird, Black-chinned Hummingbird, common hummingbirds California, Female Allen’s Humminbird, gorget, iridescent feathers, Male Allen’s Humminbird, Rufous Hummingbird on January 26, 2015 by Kim Smith.